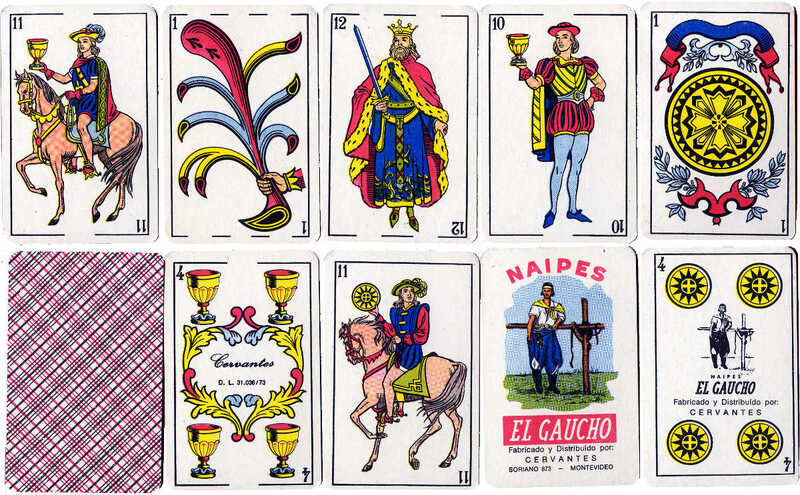 Above: Naipes ‘El Gaucho’ manufactured and distributed by Cervantes S.A., Soriano 873, Montevideo, Uruguay, c.1970s. 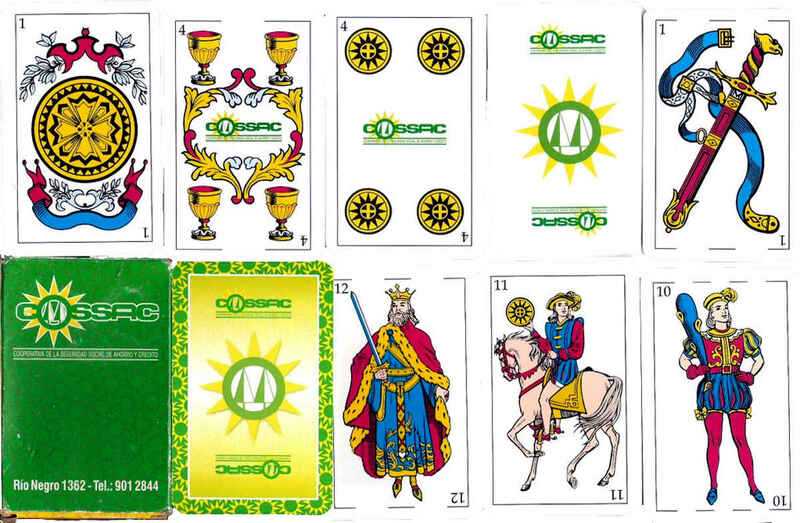 The same designs and brand name were previously produced by Gráficos Unidos S.A. and the brand 'El Gaucho' was also produced subsequently by Caraven S.A. but with completely different designs. Cervantes S.A. also published Naipes ‘Don Quijote’. Advertising packs with the same designs have also been produced more recently by an anonymous manufacturer (probably Imprimex, S.A.), as shown below. The ‘El Gaucho’ title cards have been replaced with extra advertising cards. 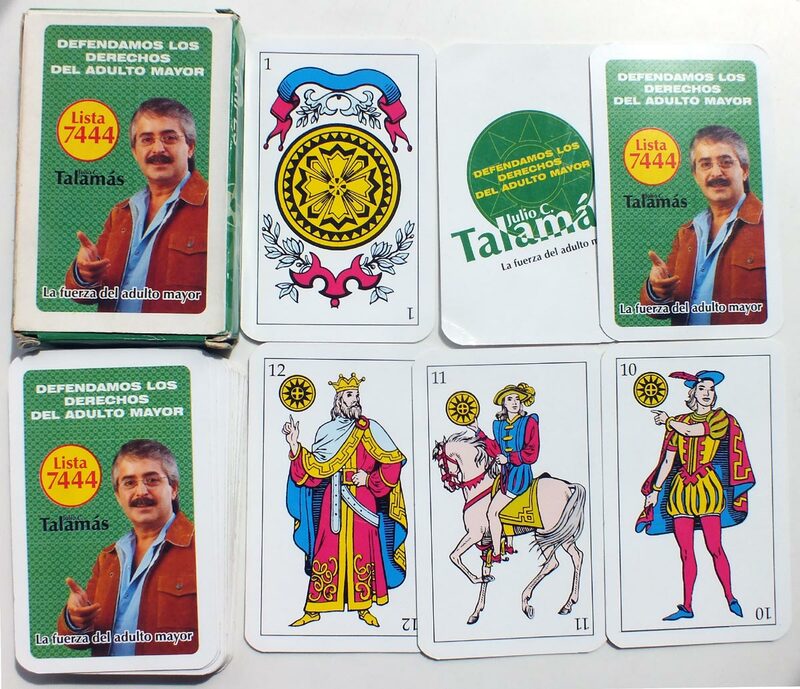 In the second example for Julio Talamás "Lista 7444" no manufacturer's details or inscriptions are shown on the fours of coins and cups, but the name 'Plasur' appears on the box flap. In another edition commemorating the Campeonato Nacional de Truco, sponsored by Gregson's Whisky, the name 'Imprimex' appears on the box flap. 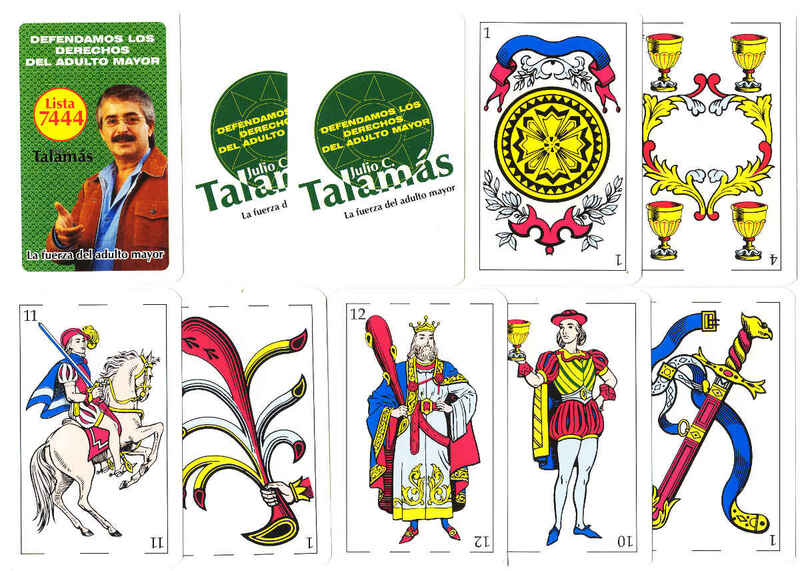 Above: Uruguay style playing cards for Julio Talamás, produced by Imprimex S.A. (Plasur), 2006. 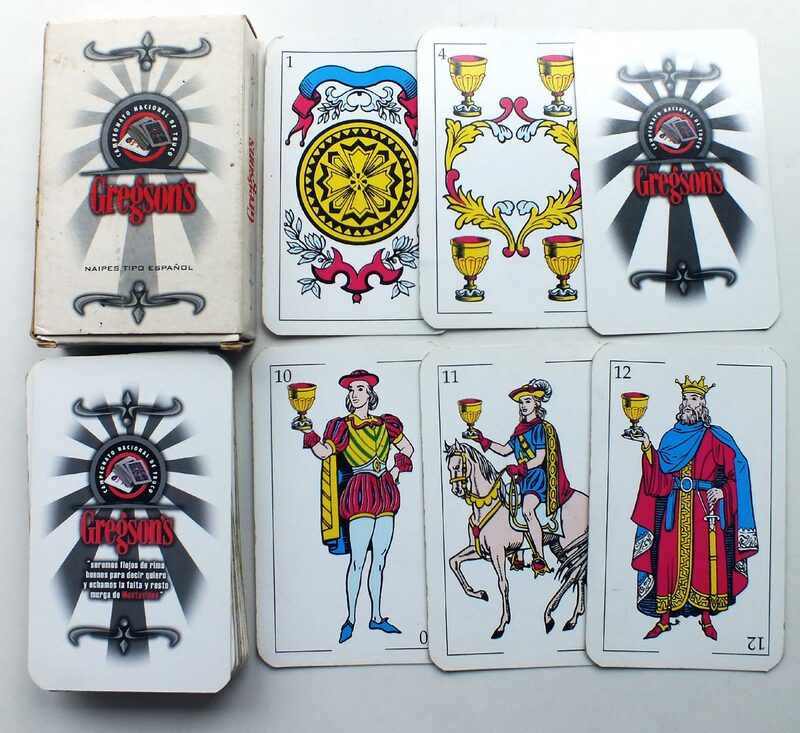 Above: Uruguay playing cards for Gregson's Truco Championship made by Imprimex S.A., 2008. 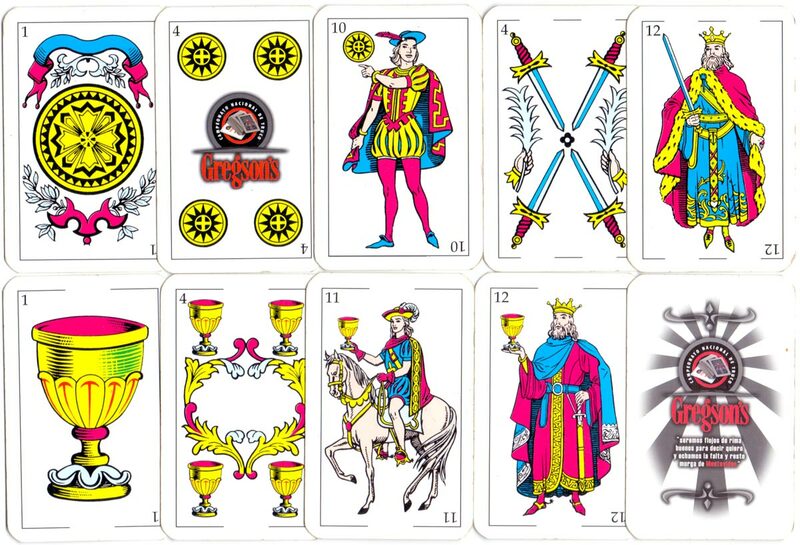 The designs on these packs consists of numeral cards based on the old 'Parisian' Spanish-suited pattern along with the fantasy 'Castilian' court designs published by Gráficos Unidos S.A. in the 1960s, and only found in Uruguay. The brand 'El Gaucho' was also produced subsequently by Caraven S.A. but with standard designs.